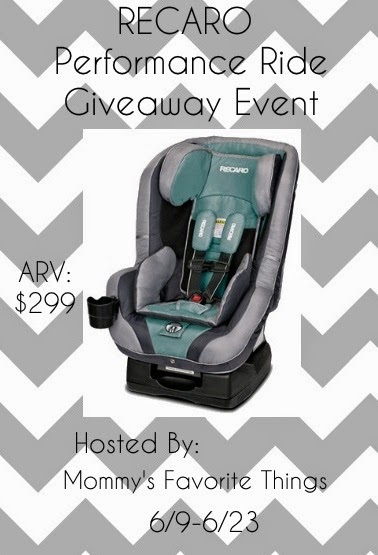 Welcome to the "RECARO Performance Ride Giveaway Event" sponsored by Mommy's Favorite Things. This event is from 6/9-6/23. RECARO has a wonderful convertible seat, the Performance Ride. Rear facing from 5-40 pounds and forward facing from 20-65 pounds means this seat will last for most of your child's car seat needs. RECARO has over 100 years of history designing seats for the world's most prestigious automobiles, airlines, and race cars. RECARO is German engineered, and an international leader in seating safety, design, comfort and style. RECARO is the pioneer of child seat side impact technology, going beyond any side impact requirements as tested with the ADAC European standard. For your peace of mind - every seat is built with RECARO's superior side impact protection technology. You can check out the review of the Performance Ride on Mommy's Favorite Things here. One winner will get the chance to win a Performance Ride in the Marine color shown above! !